Online ordering is for shipping to a family’s home by USPS. For local delivery, please call our store. 724-861-8180. Local delivery will include a complimentary floral attached to handle with box. 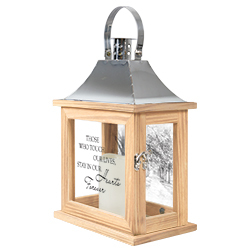 “Hearts Forever” Memorial Lantern – Inscription reads, “Those who touch our lives stay in our hearts forever.” Our Memorial Lanterns are made from quality composite wood and a stainless steel finish top. They feature a built-in automatic timer which runs for 6 hours on and 18 hours off(3-AAA batteries are included). DO NOT use fire burning candles in the lanterns. Suitable for hanging or free-standing use inside or outside. Please let us know in checkout where it says NOTES, how you would like your card to read so the recipient knows who it is from . For instance, With deepest sympathy, in memory of Mary, she was a great friend to many and loved by all. Love, The Smith family.